Released in 1989, the Game Boy combined the portability of the Game & Watch with the cartridge games of the NES. 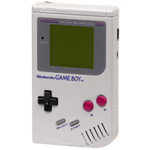 Nintendo followed the Game Boy with a number of improved models, including the Game Boy Pocket and Game Boy Light. The release of the Game Boy Color in 1998 ushered in the next evolution of the Game Boy line. Regional release lists of first-party games for the Game Boy & Game Boy Color. Information on all first-party Game Boy hardware and accessories.